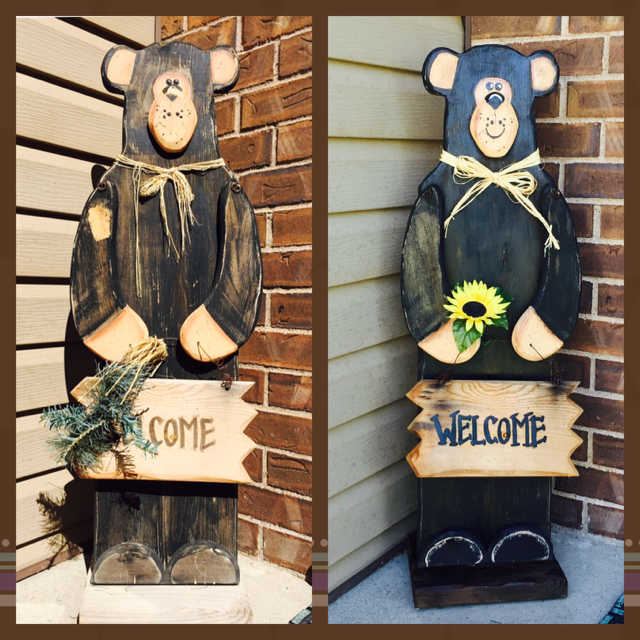 On our front porch stands a wooden bear holding a sign that says “Welcome.” I first found him at The Quilted Bear and thought he would be a great Christmas Present for my dad. He fit in perfectly with the oak brush and pine trees in the yard of my dad’s home nestled at the foot of the Wasatch Mountains and he stood proudly on my dad’s front porch for many years welcoming visitors to his home. When my dad passed away a few years ago my sisters and I spent many hours taking walks down memory lane as we divided our parents treasures and claimed our rich inheritance. One of the rules was, if one of us sisters had given something to our parents as a gift, then that sister got to have that item. That is how Welcome Bear came to live on my front porch. He was a little worse for the wear but he has been proudly welcoming visitors into our home for a few years now. 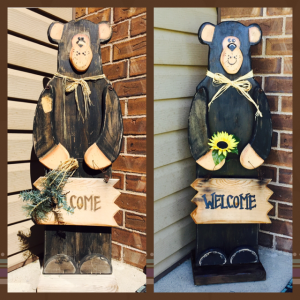 Lately, I started to notice that Welcome Bear was looking a little more shabby every day. I decided it was time to give him a makeover! I clipped off the old rafia and decorations. I used pliers to pull out the staples that were holding them on. He needed a bath so I took a wet cloth and wiped him down front and back. With acrylic paint from the craft store, I gave him a shiny new coat. He was originally painted in such a way as to look a little worn and “country or rustic” like so I tried to keep the same look. A smile and slightly bigger eyes were easy modifications to add with the paint and I think they give him more personality. His base stand was particularly worn out. The wood was dry and brittle so I painted it with wood stain. I sprayed a nice finish of clear coat thoroughly over the entire bear. I tied a new rafia bow around his neck and secured it with some hot glue. 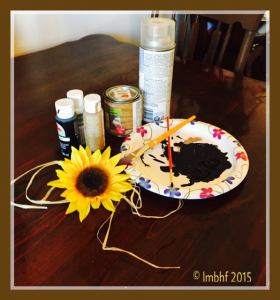 Finally, I gave him a pretty sunflower to hold so he would look extra pretty for the Autumn months. (This can be changed to a different flower or decoration for each holiday or season). Welcome Bear is all ready to continue inviting visitors to our home for many more years! « Happy First Day of Autumn 2015!